Bio Sketch: Kevin Wright studies quantum many-body phenomena and light-matter interactions using ultra-cold clouds of fermionic and bosonic atoms (lithium-6 and -7). 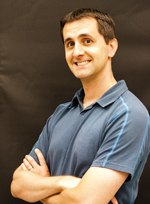 He joined the Darmouth physics faculty in 2013. Prior to that he worked at the Joint Quantum Institute in Maryland as an NRC postdoctoral fellow in the Laser Cooling group with Gretchen Campbell and Bill Phillips, where he helped build the first superfluid “atomtronic” analog of a SQUID. He received his Ph.D. in Physics from the University of Rochester in 2009, working in Nick Bigelow‘s Laser Cooling and Trapping (CAT) group on coherent optical control of the angular momentum state of atoms in a Bose-Einstein condensate.